This trip was to bring back TW to Bengaluru from my hometown. 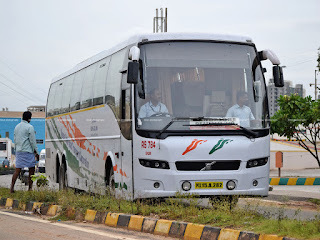 I did not search a lot while booking this ticket - headed to the Kerala SRTC website straightaway, and booked two seats on the Ernakulam-Bengaluru Garuda King Class (Volvo Multi-Axle) service. Interestingly, this bus offered the cheapest fares for that day (among AC buses) as well. This was my first visit back home after marriage - it was tough to leave home, like every time. We left home a little past 1845hrs - with a target of reaching Thrissur by 2000hrs, giving us sufficient time to have dinner as well. The backup plan was to have dinner where ever the bus stops for a break. We managed to get a bus soon, and could reach Thrissur by around 2000hrs or so. Although I had plans to go to a famous restaurant nearby, the prospect to having to lug the bags for quite some distance made me drop the idea. We stopped by at a hotel right outside the bus station - and, to be honest, I had no expectations from them given the location. However, they served really awesome dosas, and both of us were left wanting more. Full marks to Hotel Aaradhana for that! We headed to the bus station around 2030hrs or so - headed to the restrooms and then waited near the fuel station. Thrissur bus station was at its peak of messiness - as usual. Buses were parked haphazardly, and there was no place to even move around. 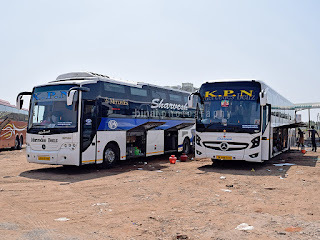 While we remained at the fuel station waiting for the bus to come, I noticed a Volvo of Kerala RTC already at the platform (a little past 2055hrs) - we rushed there to see it was indeed our bus. A known guy was at the wheels (Mr. Shajuddin Badar), and an even familiar guy was the conductor (Mr. Baiju) - I was sure, I was in for a great journey. 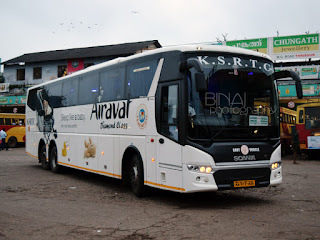 We started off from Thrissur at 2111hrs - Shajukka (The driver) is a veteran on the route, and has been driving for well more than 6 years in the same route now. He knew the route like the back of his hand - he is a known speedster and is known as an efficient driver on the road. We quickly left the city and got to the National highway, towards Palakkad. We made swift progress till we reached Kuthiran - we got stuck in traffic for a while. The bus pulled in for dinner at the usual place, just past Mangalam Palam near Vadakkenchery, by 2202hrs. We used the time for a stroll, since we had already taken our dinner. We started off after dinner by 2231hrs. I was sleepy by now, and slowly set off the sleep cycle by now. Lights were switched off, the movie they were playing had also finished - so perfect setting to sleep. I woke up just as the lights were turned on, after reaching Palakkad bus station (2258hrs) - the last of our pick-ups. Boarding was quick - the conductor took a final head count (we were full - 49 on 49), and we started off by 2308hrs - late by an hour and 8 minutes now. A little into the ride, I realised that my seat's back rest wouldn't lock in its reclined position - the lock wasn't working properly. It locks midway, but not in the full reclined position. I found a position to sleep and slept quite quickly. I slept quite well - but woke up with a jolt when the guy sitting behind kicked my seat quite hard, shouting out "its paining yaar". Looked like he had some injury in his leg, and may be my seat back was pressing on that. I changed the angle of recline and slept off again. Another long sleep, and I woke up hearing the conductor calling out for Electronic city passengers - we reached Electronic city by 0458hrs. Dropped passengers and moved quickly. There was a mini traffic block at Silk Board (Due to water logging) - we reached there by 0513 and left by 0515. We reached Madiwala by 0518 and Majestic (Kempegowda Bus Station) by 0535hrs. At this point the conductor went around to check with passengers about their alighting point - and confirmed that the bus wouldn't go to Mysore road. We started from Majestic by 0537, and finally reached Basaveshwara Bus station aka Peenya Satellite bus station by 0559hrs. 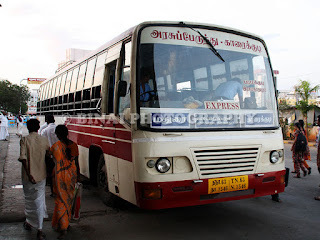 Summary: The bus, KL-15-A-284 (RS784) of Ernakulam depot had about 7.03 Lakh kilometres on the odo. The bus really showed age - quite a lot of rattles from the rear axles, damaged seats, etc. The overall maintenance seemed good - but not the usual style of Ernakulam depot. 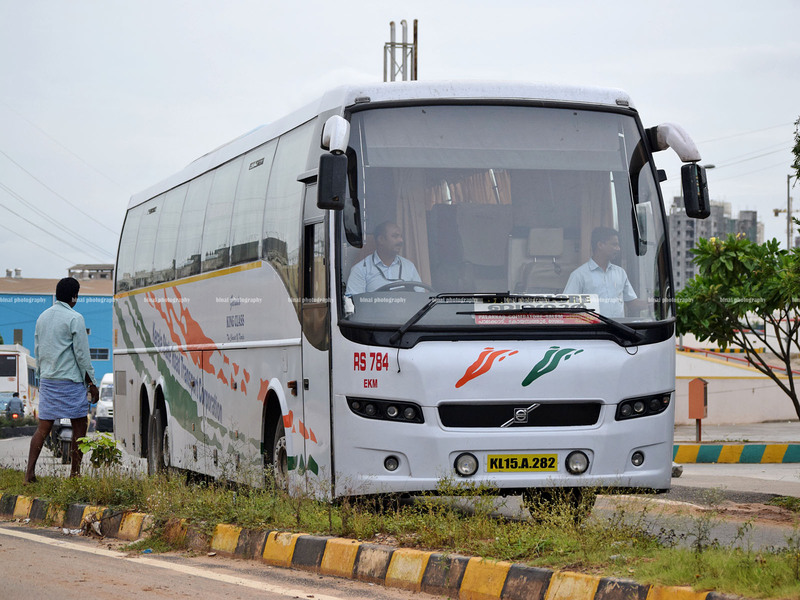 Interestingly, the bus had completed its fitness test only a month before the journey. This bus also had a working wifi service - the wifi connection actually worked till we passed the state border. The crew were great - very cordial and friendly. They assisted passengers with their baggage and made a note of alighting points as well. Blankets were neatly folded and kept on all the seats, water bottle was kept in the cabin (available on request, like it is in all Kerala SRTC buses). A movie was played, which was turned off as we started after dinner. Overall, great service - its already among my favorites! Entertainment: Available, A movied played. Will I take this service again? Absolute - already among my favorite services.